Militants in Niger Delta have bombed a state-run oil pipeline near the southern port city of Warri, Delta State, the second attack within a week, officials said. According to AFP, the explosion occurred this morning, November 8, and is the second attack in one week. “The line which was undergoing repair after the previous attack … was billed for commissioning either today or tomorrow,” before the latest attack, the chairman of Batan community Dickson Ogugu told AFP. The community leader also said that four surveillance guards deployed to protect the Trans Forcados export line narrowly escaped death after the militants opened fire on them. The bombing had early been confirmed by an army officer, who pleaded anonymity. “We heard the shots in the middle of the night, but as you know, we do not patrol the area at night, so there was nothing we could do,” the Army official said. 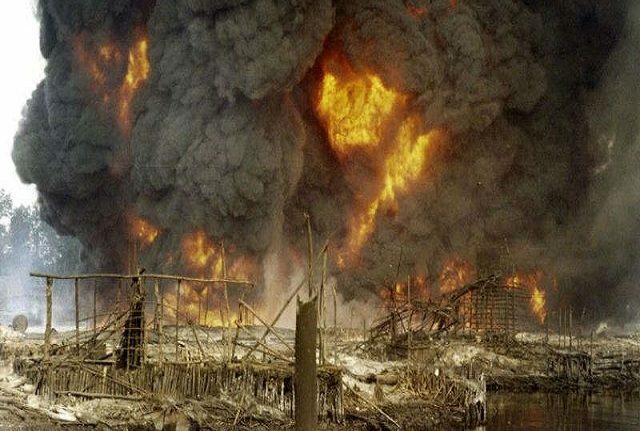 The line was previously bombed by the ‘sabotaging’ militants, last week, afterPresident Muhammadu Buhari had met with their representatives to discuss how to end the issues bedeviling the region. The state-owned Pipelines and Product Marketing Company (PPMC) operates the pipeline which receives crude from the Batan flowstation and feeds the Forcados export terminal.